A cuddly toy of your rhino. A factbook on your rhino together with bookmarks and stickers. Two exclusive magazines: WWF’s ‘Wild World’ and ‘My Rhino’ with news and updates for your adopted animal. Rhinos are solitary creatures, which like to spend time alone unless mating. They are very territorial and mark out their areas using dung to ward off other rhinos! They like to live in wooded areas and are very inquisitive of intruders into their territory. Their horn is put to good use if they feel under threat. 95% of all Kenyan black rhinos have been slaughtered by poachers. Your kind donation will help WWF to stop the illegal trade in rhino horns and help them try and preserve these incredible creatures habitat before it’s too late. Rhinos can grow to over 6 feet tall and can run at speeds of up to 35mph. The longest ever recorded horn was an astounding 4ft 9inches! Rhinos wallow in mud and let it dry to create their own form of sun block. A black rhino can last up to 5 whole days without water, but it would be pretty grumpy! I’m a black rhino and I desperately need your help. My home is Kenya where poachers have hunted most of my friends and family for human uses. It’s so bad that there are now only 500 of us left alive, and unless something is done we will become extinct very soon. Please adopt me today and help WWF to stop the illegal trade in my horn, it looks much better on my face than it does ground down and sold as medicine. The rhinoceros is one of the few remaining species from the ancient era of giant mammals. Today, the only land animal larger than a rhino is the elephant. Like all large herbivores, rhinos spend a great deal of time grazing or browsing for enough food to nourish their massive bodies. There are several subspecies of rhino that fall into two basic categories. The Asian rhinos live in eastern India and south East Asia and are identified by a single horn and thick leathery skin that acts and looks like armoured plating. 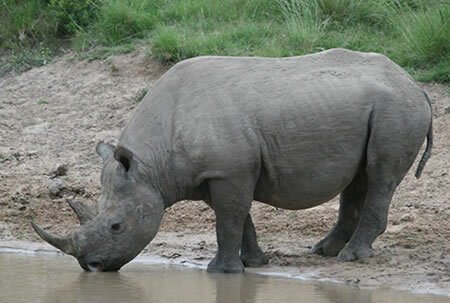 African rhinos are much larger and have two horns. African rhinos are called “white” or “black” rhinos. Both are grey. Dutch settlers called grass-eating rhinos “wyd rhinos” because of their wide, square mouths. British settlers misunderstood the meaning as “white” and named leaf-eating rhinos “black rhinos”. Black rhinos have pointed prehensile lips that can strip branches of leaves and fruit. Rhinos are considered nocturnal. They graze for food during the night and at dusk and dawn. During the day they find shady areas to rest. Having very little hair on their bodies, rhinos tend to wallow in mud. The mud protects their skin from insect bites and sun damage. Black rhinos tend to stay by themselves or with their babies. White rhinos graze in groups of up to twelve individuals. All rhinos have a strong sense of smell and use this to find group members after they are separated. During the day, rhinos are in constant danger from poachers. Evolving with no natural predators, rhinos do not show any signs of caution and will wander into open areas without hesitation. Poachers consider the rhino an easy target because they tend to visit watering holes at the same time each day. Poachers can easily kill them just by waiting with a rifle. Once killed, poachers often take the rhino’s horn and sell it on the black market. A rhino horn can sell for more than one hundred fifty thousand British pounds. To help save endangered rhinos, many conservationists have created animal adoption programs. People can adopt a rhino symbolically to support programs that protect their habitats. There are also rhino adoption programs that provide for the law enforcement to stop trade in rhino horns. The first thing you notice about me is that I look like I was built for battle. Obviously, there’s the big pointy horn at the end of my nose. That horn looks like it’s made from bone but it’s actually made of the same kind of protein as your fingernails. My horn grows like a fingernail too, at a rate of eight centimetres each year. My horn can grow up to one and a half meters tall. Notice too that I have super strong head and neck muscles. So if someone comes at me from the front I can hurt him pretty badly just by ramming into him. My head is like a battering ram. If an animal like a tiger tried to sneak up on me from behind, he’d soon find that his teeth are useless against my armour plates. You heard right. I have armour. My skin is so thick and hard that it protects me from all natural predators. It also helps me to keep my baby safe until she’s old enough to protect herself. I’m not just big and strong. I’m fast too. I was clocked doing 30 miles per hour. If I could wear sneakers, I’d break the speed limit. If I started running, you would feel the ground tremble and shake. It is best that you stay out of the way. I can turn pretty quickly but I don’t have good eyesight and I might not even see you. Another thing that you should know about me is that I’m a very devoted mother. 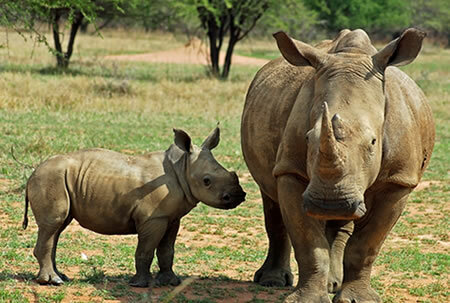 Most animals have a few babies at once but rhinos only have one child every few years. Our babies live with us for three years so that we can help them out and protect them until they are big enough to be on their own. I don’t see very well, but my sense of smell is strong so I always know where my baby is. My biggest danger is poaching. Endangered rhinos are being poached for their horns. Our horns are used in Asian countries to make traditional medicines but there is no evidence that rhino horns improve a person’s health in any way. The horns are also used to make ornamental daggers for decoration. Not all people hurt rhinos though. Many people work hard to help protect us. Animal adoption helps to save many species. People who want to help us can adopt a rhino in the wild. Rhino adoption helps to sponsor endangered rhinos and raise money for their protection. There used to be more than half a million of us but at one time people used to shoot big animals for sport. Now there are less than twenty thousand wild rhinos. It’s against the law now but people still hunt rhinos for our horns. We do get help through animal adoption programs. Some people adopt a rhino. Rhino adoption helps protect us. When people adopt a rhino they donate money that is used to pay for our protection. The world’s rhino population can be found in Africa and South Asia. Their numbers are under threat from poachers who kill them for the use of their horns in medicines. To compound things, countries where rhino populations exist have been ravaged by wars, making the enforcement of international law against their killing, difficult to enforce. A few centuries ago, vast herds of rhinoceros dominated the plains of Africa. Sadly, hunting and poaching have reduced their numbers from more than half a million to less than twenty thousand. Three out of the five remaining rhino species are critically endangered. The population of white rhinos is starting to increase but needs continued support. Because rhinos have only one baby every few years, population recovery is very slow and precarious. Poachers kill off rhinos faster than they can reproduce. Black rhino and Indian rhino populations are continuing to decline. There are less than two thousand Indian rhinos left in the wild. The Javan rhino is critically endangered. There are only sixty Javan rhinos left, making it the most endangered mammal on earth. The leading cause of population decline is because rhinos are killed by poachers. Rhinos are killed for their horns to be used in traditional Asian medicines. As the people of Southeast Asia has become more affluent, there has been a drastic increase in demand for rhino horns. 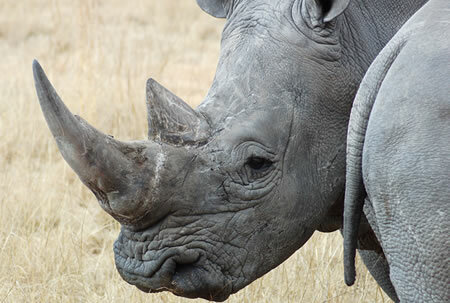 Trading rhino horns and body parts is banned under international law. Not all countries enforce this law. African rhinos live in countries that have been plagued with war and political instability. This makes it difficult to enforce laws about poaching and hard to protect the rhino’s natural habitat. It has been so hard to stop poachers that some conservationists capture rhinos and surgically remove their horns before returning the rhino to the wild. Those horns are disposed of and not sold. The poachers leave those rhinos alone because there is no financial incentive to killing them. Protection focuses on preserving existing habitat, uncovering the illegal trade of rhino horns and working with authorities to save and protect rhinos from illegal poaching. 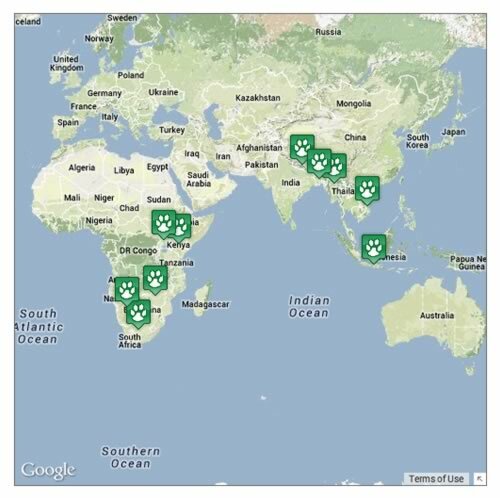 Animal adoption organisations help to procure funds for conservation. Zoos often have fundraising campaigns where patrons can adopt a rhino in the wild. Rhino adoption helps to protect the habitat of endangered rhinos. Rhinos are found in Africa and south Asia as indicated on the following map.